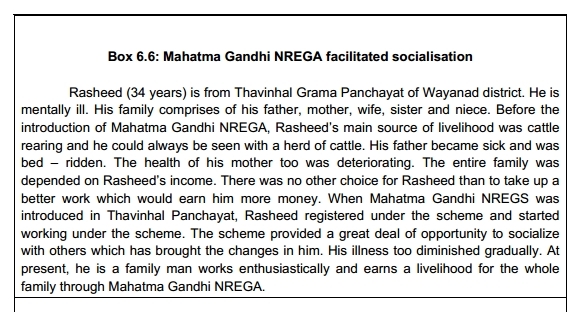 The Mahatma Gandhi Rural Employment Guarantee Act/Scheme (MNREGA) aims at enhancing the livelihood security of people in rural areas by guaranteeing hundred days of wage-employment in a financial year to a rural household whose adult members volunteer to do unskilled manual work.Very recently convergence of community-based rehabilitation of people with disability (both mental and physical) with this scheme is being attempted and facilitated by various agencies. Although not as an exhaustive list presenting here below a few such detail which have been collated from the web. 3. 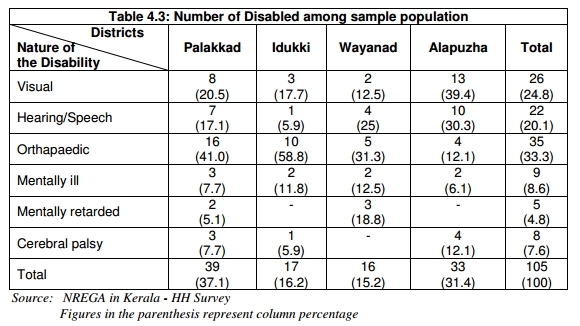 Excerpts from a study on performance of NREGA in Kerala (source Rural development Department of Kerala). …Another important aim of the project was to encourage panchayat representatives to include those undergoing treatment for mental illnesses in some rehabilitation projects such as the Mahatma Gandhi National Rural Employment Guarantee Scheme as group work can have therapeutic effect on them. In the past two or three years, DMHP Thiruvananthapuram has helped register many of its patients under MNREGS as it was found that the work is well suited to them as it is done in groups and under supervision. Once registered they can rejoin the work even if there is relapse or hospital admission, thus providing a constant source of income. 5. Community based Rehabilitation initiative of Voluntary Health Association of Tripura is facilitating employment opportunities for people with disability in the MNREGS. Therefore from above details it can be understood that the MNREGS can provide immense opportunity for extending community-based rehabilitation to people with disabilities. 20.08.2014…………There has been widespread reports of MNREGA becoming financially inefficient because of corruption in implementation. There has been no clarity of its aim, lack of non creation of tangible assets has been a drawback. In terms of efficiency of the program via a vis its aims of creation of tangible assets, it could be questioned if including disabled people into MNREGA will dilute its aim of creating tangible assets in a time bound manner. With a change in orientation of the program from just giving jobs with assured work days and wages to one where such work translates into outcomes of measurable assets, the continued inclusion of disabled people in the scheme can become difficult in future. By kumarRam in Services & Policy on November 21, 2012 .